I’m not posting any pics of Zion. Well, okay, just one. That’s the view from my balcony at Zion Lodge. Believe me, I’ve taken a lot of pictures since I arrived here this afternoon. But the wifi here at Zion Lodge is dreadfully slow. It took three minutes to upload this one picture! I also took a lot of pictures this morning on one last hike at Bryce, to Mossy Cave. This is a hike that is accessed from a separate trailhead on Route 12, east of the park entrance. And I took even more pictures at Red Canyon, an area about ten miles west of Bryce that is administered by the National Park Service. I stopped for lunch at a German Bakery and Cafe in the town of Orderville, about halfway between Bryce and Zion. So many of the patrons were speaking German, I wondered if this town is a little enclave of German immigrants. But they actually made a delicious grilled pastrami sandwich with Swiss cheese and sauerkraut. I got to Zion early this afternoon. Just driving into the park was a revelation that confirmed I am not numb to beauty just because I’ve seen so much of it already. Zion takes it to a whole new level. Which brings me to consider that I may not post any photos from this wonderful place, for a few reasons. First, photos cannot capture it. Unlike the Grand Canyon, or the Red Rocks of Sedona, or the hoodoos of Bryce, there is not really scenery here. Rather, it is a feeling of just being among the beauty and majesty. At the Grand Canyon you’re in the audience and the canyon is the stage. Here, there is no separation between audience and stage. The second reason you might not ever see my pictures from Zion is that they will serve me well as a reminder of my experience here. They will not provide the same value to you. This is a place that offers a unique experience to each visitor. 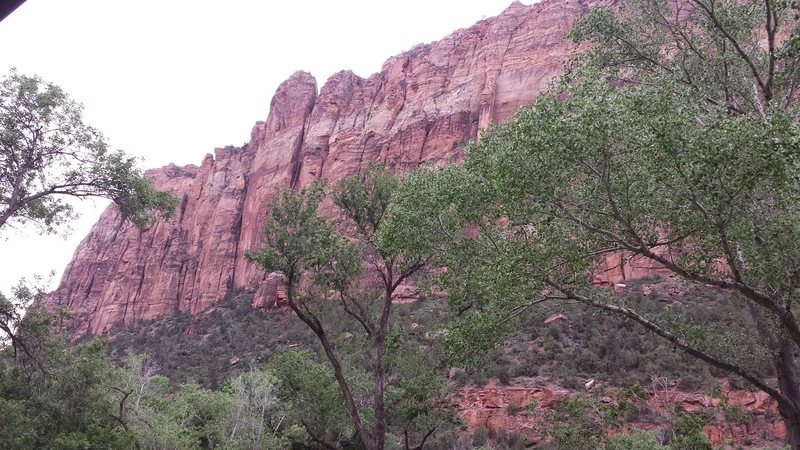 My pictures are of my Zion. In a sense they will be too personal to share, but in another sense they will give you no indication whatever of what Zion is. I did have a wonderful dinner at the lodge, sitting outside on the terrace as deer grazed on the lawn below and with a view of the mountains against the gradually darkening sky. And I’m sitting on my balcony as I write this, listening to the chirping of crickets and not much else. Everyone should come and experience this. Well not this — this is my Zion. Get your own!